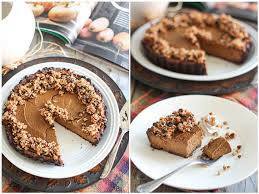 Fancy a super nutritious and delicious pumpkin pie this weekend? Why not get your groove on in the kitchen and make this healthy treat? 2. Add all the ingredients to food processor and process until well combined. 3. Transfer to a well greased removable bottom deep pie dish and spread gently and evenly to the bottom and sides of the pan with a rubber spatula to form a crust. 6. Add all the ingredients to the bowl of your food processor and process until smooth and creamy, about one minute. 7. Transfer to the reserved pie crust. 8. Bake in a 180 degrees oven for 35-40 minutes, until filling is set and top gets slightly darker. 9. Turn off the oven and crack the door open. Allow pie to cool for a couple of hours, then take it out of the oven and let it cool completely before transferring it to the refrigerator, where you will leave it to cool for at least 8 hours, preferably overnight. 11. Add honey and stir until honey is completely melted and small clusters begin to form. 12. Remove to a plate and allow to cool completely.